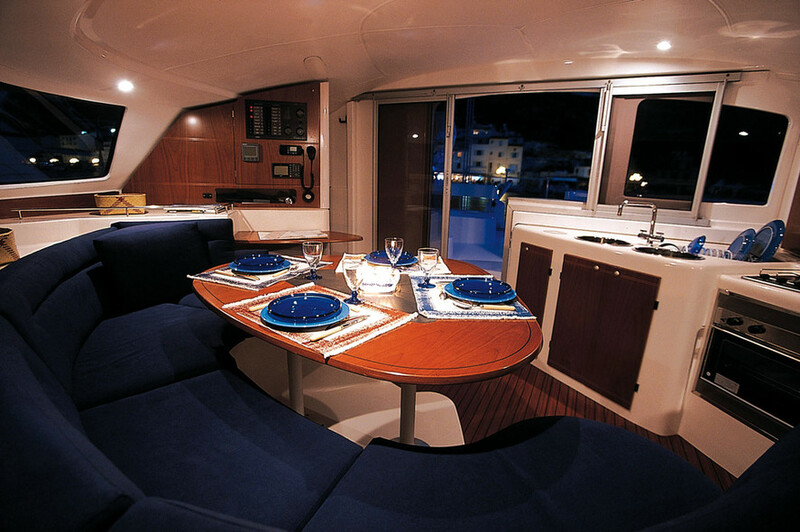 Lavezzi 40 Comfort with plenty of finesse! Fountaine-Pajot’s best-seller, the predecessor to the Lipari 41 offers some great attributes for family cruising. And more, if suitably equipped. On the dock we find a catamaran which is compact, yet rather aesthetically pleasing. All the signs of having come from the Fountaine-Pajot yard are there - even if things have evolved a little since the early 2000s. The rounded bows have now become straight, the sheer of the deck is inverted, but the sidedecks as usual drop back to the aft steps, and the coachroof has the established sun visor - nothing better has been found to combat the greenhouse effect, that heavy and inescapable heat spreading from the non-shaded windows when the sun is at its zenith. The infusion build is standard, with bulkheads and equipment fitted directly into the hulls - it’s stiff, which gives long-term reassurance. Below the waterline, the glass cloth infused with polyester resin is at least 3kg/m², while the topsides, the sidedecks and also the underside of the bridgedeck are of 15mm PVC foam sandwich. As for the coachroof, that’s made up of a 1,600 to 2,000 g/m² laminate. A largely robust construction, but thanks to the use of infusion, a long way from the previously robust generations such as the Bahia 46 or the Belize which were a little heavier. With 227 examples built over a seven year period, the Lavezzi 40 appealed to both charterers and individual owners, proof that this model lends itself well to a wide range of uses. Following in the wake of other Fountaine-Pajot models of this generation, the 40, designed by the Joubert/Nivelt/ Flahault trio, has relatively fine hulls - unlike its direct competitor, the Lagoon 380. Nevertheless, the hulls are rounded, principally to optimize the wetted area, but also to give better load carrying capability. This needs to be limited to less than two tonnes if you want to maintain performance at sea, whereas the Lagoon can take one tonne more. A design choice which indisputably translates into a yacht which is not only more lively under sail, but also more elegant. As evidenced on the water, even though the Lavezzi 40 will never be a star performer upwind, particularly in light airs (her keels at 1.10 meters are really short), in moderate winds our catamaran rapidly picked up to 7 or 8 knots. It must be said that the boat really benefits from the narrow and powerful rig. The Z-Spars mast, solidly stayed, has two sets of spreaders, contrary to most other cats which only have one. Because of this, the mast is better supported in a big sea. The mainsail is tall and has a generous roach. The salon table is big: perfect for enjoying meals with the whole crew. But also for use by navigator, who will quickly find the chart table too small.